Perhaps the most versatile Mazda vehicle over the last number of years has been the compact crossover Mazda CX-3. The Mazda CX-3 has always been an efficient, practical driving machine. Something it has been missing, however, is a sense of class and sophistication. Well, the 2019 model is here and Mazda worked on the luxury factor. For the first time in the vehicle's history, the Mazda CX-3 comes available with full-leather seats on all trim levels. With that, much of the interior has been redesigned and new features are present. On a less aesthetic note, the old cable parking brake has been totally replaced with an electronic unit. For looks and comfort, red accent lighting, faux-suede appliqués, fold-down armrests, and refined materials are all new additions to the Mazda CX-3's interior. All of the glitz and glamour that goes inside a car is great, but what's under the hood is more important to some drivers. Each of the 2019 Mazda CX-3 trim levels come with the same engine. A 2.0-liter inline-four-cylinder engine with 148 horsepower is what makes the Mazda CX-3 go. That engine produces 146 pound-foot of torque. A six-speed automatic is the only transmission available and it comes with auto-manual capabilities. What really helps the Mazda CX-3 stand out is its efficiency. Despite its crossover nature, drivers will average 34 highway MPG when behind the wheel of the 2019 Mazda CX-3. Even city drivers will get 29 MPG. There is still more to learn about this beautiful new crossover SUV. In the rear, you will find 44.5 cubic feet of cargo volume which is more than enough to pack up for a weekend getaway. Come see it for yourself! 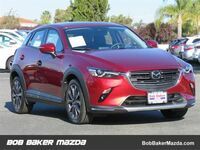 The team here at Bob Baker Mazda is eager to show you all the other details on the new Mazda CX-3 and we can even get you set up with a test drive. Come on down and take it for a spin!